According to the Mozarteum this portrait was done in 1826, but this dating seems to be false since Thomas Spitzer already died on 15 August 1821. In early 2010 Günther G. Bauer published his book Mozart. 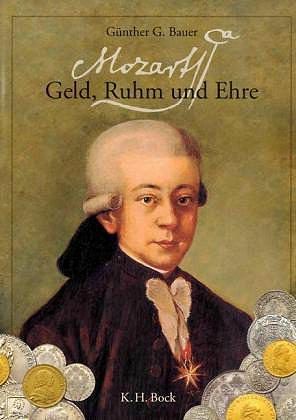 Geld, Ruhm und Ehre in which he claims to shed light on Mozart's finances. Bauer's book is one of the worst books on Mozart in recent years and a true example of what today's fake Mozart scholarship can lead to. Bauer presents an endless heap of pointless speculation on Mozart's expenses that have no basis in archival research and no connection whatsoever with primary sources. One of the worst flaws of Bauer's book is the fact that he naively takes his data on Mozart's income from Maynard Solomon's Mozart biography, not realizing that Solomon's numbers themselves are the result of ill-informed presumptions and flawed estimates. Bauer's book is basically a huge waste of money which Bauer mistakes for a pathbreaking study in cultural history. The most entertaining parts in Bauer's opus are definitely the ones where he tries to apply his imaginary research skills to deal with special issues of Mozart's finances. 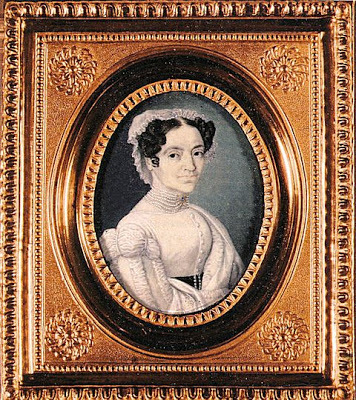 In the chapter titled "Goldene Uhren, Schmuck und Tabatieren" ("Gold Watches, Jewelry and Tobacco Boxes") Bauer claims to have identified the jeweler who made Constanze Mozart's pearl necklace and its valuable clasp. His line of argument is absolutely priceless. Curiously, Bauer turns the name Haas into "Häas", an error which was obviously caused by two scratches above the first "a" in Haas's name on the printing plate of the above list. Of course the name of this tradesman was Haas. The name "Häas" does not exist, except in Bauer's imagination. 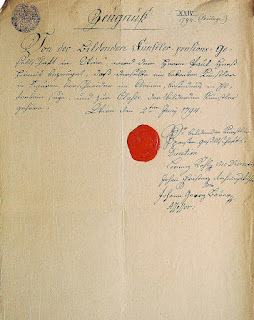 All the primary sources pertaining to the merchant Johann Georg Haas (1754-1826) in Vienna's archives are absolutely clear in concern of this issue. It turns out, however, that Bauer desperately needs the hallucinated umlaut in "Häas" to establish a connection between Constanze Mozart's pearl necklace, Mozart's debt and Johann Georg Haas. Based on his willful renaming, Bauer identifies the "famous Hesse", whom Constanze Mozart mentions in her will, as the Viennese "Galanteriewarenhändler" Johann Georg Haas whom, for the sake of this tormented identification, he must call "Häas". And yet, whoever knows even a little bit about jewelry and ivory sculpture in the eighteenth century realizes immediately that the "famous Hesse" can only refer to the really famous Sebastian Heß (1732-1800), or his younger brother Paul Heß (1744-1798). Because of their miniature ivory sculptures, carved with inexplicable mastery, set on a blue background and covered with rock crystal glass, these two engravers (as they modestly called themselves) have become truly legendary figures in the history of art. The Viennese Galanteriewarenhändler Johann Georg Haas (who was not a regular jeweler and therefore was not allowed to sell pearl necklaces) has no provable connection with Constanze Mozart's pearl necklace. 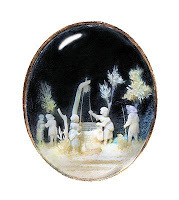 This unique piece of jewelry, whose value in 2002 was estimated at 375,000 €, is only seven centimeters wide. The three river miniature landscapes contain 26 figurines, five houses, five trees and two ships (of which one is only one milimeter high). The blue background is made of pulverized cobalt, applied inside the silver case that holds the sculpture. The brothers Heß, born in Bamberg; for a long time they lived in Brussels, where especially the elder stood in high regard with the late Prince Charles of Lorraine whom he had to assist in the Prince's various hobbies. Since several years both brothers have settled in Vienna where they still reside. 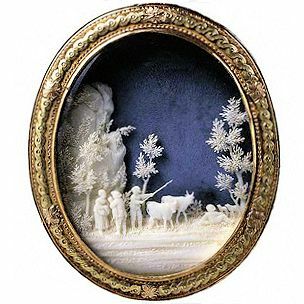 The actual object of their art consists of ivory, whereof especially the younger delivers pieces of incomprehensible smallness and delicacy; by then (1780) he was working on a box lid for the Russian Empress that shows a rural landscape with trees, a farmhouse, and a view on the water where one could see people, cattle and everything arranged and executed so splendidly that the incomprehensibly small is in no way inferior to the greatest in art. He also makes bracelets of this kind for ladies and rings for both sexes that currently are so very popular in Vienna that only few ladies and gentlemen don't wear them. Heß makes his trees and figures through a magnifying glass piece by piece and then pins them with glue into the ivory bottom one after the other. The background is always blue to make the beauty of his wooly incomparable trees even more discernible. His forgrounds he usually decorates with a bridge, Roman ruins or a country house. At the same time he knows how to set everything properly into action; at one place he engages a countrywoman in feeding her fowl and you see the oats fall from her hands: elsewhere a young man is standing in a tree, throwing an apple into the apron of a girl and you can actually see the apple's stem in his hand: at a third place a woman is drawing water from a well and in her hands one can see the ivory rope going across a wheel: here and there he puts a recumbent sheperd with his cattle, or assigns some other rural activity to his figures. [...] Heß is a completely singular genius and an enthusiast of this art which he is able to judge with deep understanding. The easiness of his work is incredible; I have been watching him many times for hours with amazement, how he produces one creature after the other with his delicate saw; one thinks to be able to imitate the man's work, only to finally leave him, indignant about the fact that nobody can learn anything from this man who certainly has no peer. Archival research shows that there were actually four Heß brothers living in Vienna in the last quarter of the 18th century. 1) Theodor Heß. He was born in 1730 in Bamberg the son of master locksmith Philipp Jacob Heß and his wife Maria Margaretha. He was the first of the Heß brothers, who moved to Vienna. At the occasion of his marriage on 14 August 1768 to Maria Magdalena Kreyl he declared to have come to Vienna already in 1764. Theodor Heß's best man in 1768 was his younger brother Conrad's father-in-law Joseph Gissinger. From 1768 (or even earlier) until his death Theodor Heß always lived in the house "Zum weißen Schlüssel" ("At the White Key") No. 363 in the Tiefer Graben (today Tiefer Graben 13). With his first wife Heß had one daughter and three sons, all of whom had Johann Baptist Puthon and his mother Eva Barbara Schuller as prominent godparents. Puthon (1745-1816), who by that time was still addressed as "Wechsler" (banker), was soon to become one of the wealthiest factory owners and merchants of the Austrian monarchy. Heß must have made the banker's acquaintance at the house of his first father-in-law Franz Kreyl who ran an inn in Puthon's house Stadt No. 309 "Zur großen Weintraube" ("At the Large Grape", today Am Hof 7, the place of birth of the painter Joseph Mathias Grassi). After the death of his first wife Theodor Heß married again in 1782. His second wife was Elisabeth Schubert, daughter of Albert Schubert, a carpenter at the Schottenhof. She bore Heß two more daughters (1783 and 1789). Theodor Heß, "K.K. 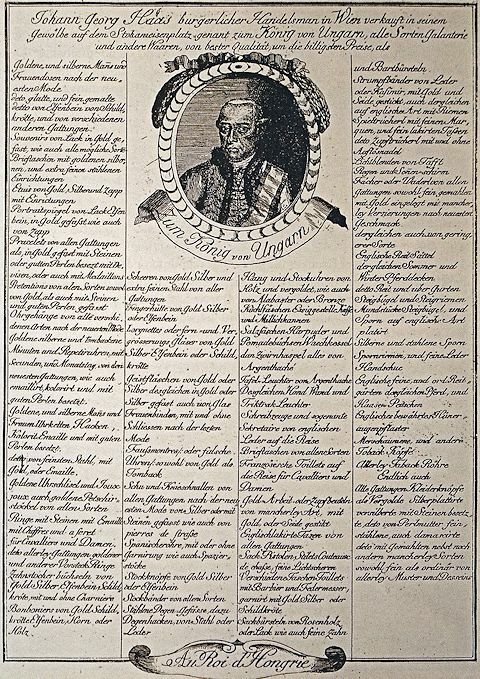 Hof und bürgerlicher Schlossermeister" died of "Harnblasen" (some urologic problem) on 5 December 1798. The sources suggest that Sebastian Heß and his brothers already came to Vienna before 1770. By 1773 Sebastian was definitely active there, since in that year he started to work on his brooch for the Empress which he finished in 1775. 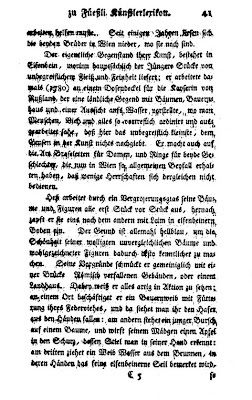 In 1790 he published a book titled Geschichte des alten Roms in Medaillen von Johann Dassier und Sohn (gedruckt bey Fr. Ant. Schrämbl. k. k. privileg. Buchdrucker und Buchhändler) in which he calls himself "engraver and mechanic at the late Prince Charles Alexander of Lorraine". In Vienna the brothers Sebastian and Paul lived together in the house Stadt 116 on the Schottenbastei (today Helferstorferstraße 1) which is documented by the church records of the Schotten parish and Ignaz de Luca's 1787 handbook Wiens gegenwärtiger Zustand unter Josephs Regierung. 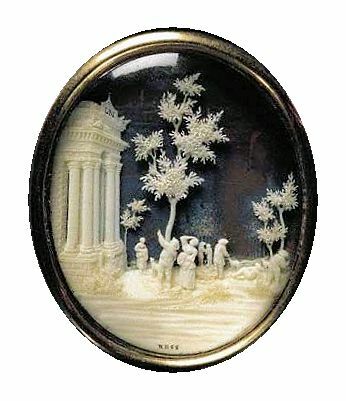 Sebastian Heß also produced medals and cast copies of his own micro-sculptures which he made of a special alabaster-like substance and sold for seven Kreuzer apiece. 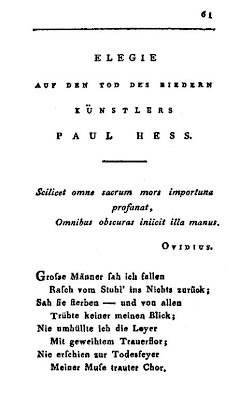 Before 1798, a major strife seems to have occurred between the brothers, because on 23 March 1799, almost a year after the death of his younger brother, Sebastian Heß published an ad in the Wiener Zeitung, in which he completely denied the artistic activity of his brother Paul and denounced him as mere distributor of his own ivory artworks (a claim that is of course refuted by J. G. Meusel's account and other testimonies). Dem verehrungswürdigsten Publikum den irrigen Wahn zu benehmen, daß mein nicht mehr lebender Bruder Paul Heß, der wahre Künstler in Graveur=Arbeiten aus Elfenbein gewesen wäre, fordert mich auf, hiermit öffentlich bekannt zu machen, daß ich diesem, nur den Verkehr meiner Arbeiten, in Rücksicht seiner Familie, übertragen hatte, zugleich aber auch anzuzeigen, daß von nun an bey mir selbst Bestellungen auf alle Gattungen von Graveur=Arbeiten aus Elfenbein, als: Figuren, Blumen, Opfer, Namen, kleine Landschaften u.s.w. für Kabinetstücke, Schliessen, Medaillons, Dosen und Ringe können gemacht werden. To relieve the honorable public of the mistaken illusion that my deceased brother was the true artist of the ivory engravings, I see myself obliged to publicly declare that out of consideration for his family I had merely assigned him with the distribution of my work. 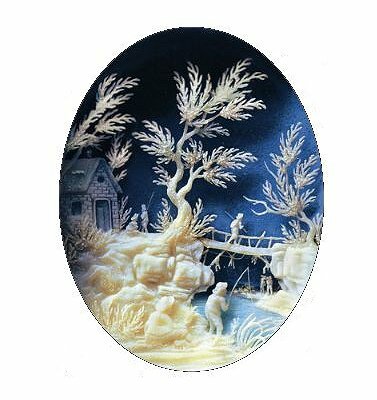 At the same time I herewith announce that from now on orders can be made with me personally for all kind of engravings from ivory, i.e. figures, flowers, votiv pictures, names, small landscapes etc. for cabinet pieces, clasps, medallions, boxes and rings. Sebastian's wife Anna Heß ("Kunst=Graveurs Ehegattin") died on 5 February 1786 of uterine cancer at the age of 55 in the so-called Tischlerherberg, Stadt 1344 ("The Carpenters' Hostel", today Ballgasse 8). In the 1788 municipal tax register Sebastian Heß is still listed as tenant of a three-room apartment on the fourth floor of this building. 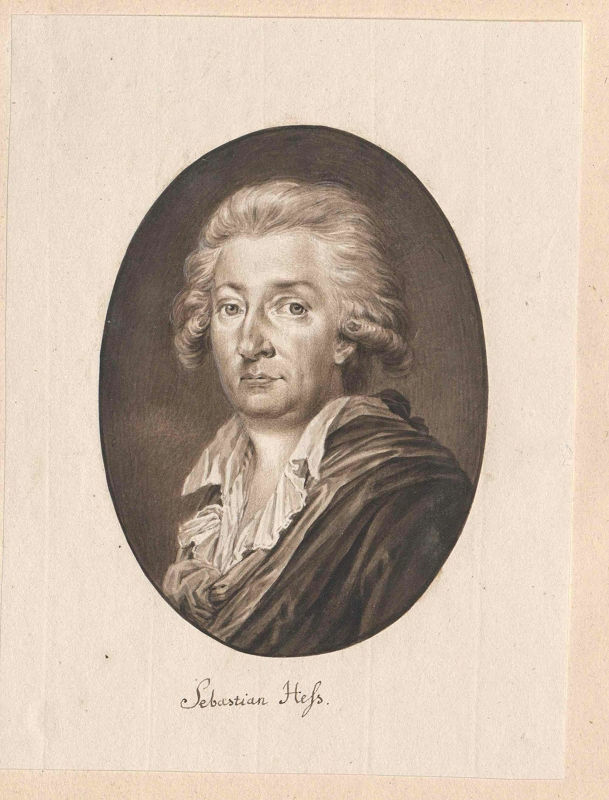 Sebastian Heß had two children: Elisabeth, born in Brussels in 1767, and Franz, born in 1769, who at the time of his mother's death served as artillerist in the Austrian army in Kaiserebersdorf Castle. When Sebastian Heß died on 13 December 1800 of dyspnea ("an Dampf") in the house Jägergasse 20 on the Laimgrube (today Papagenogasse 4), both his children were already dead. Heß's belongings were auctioned off for net 255 fl 28 x, but at the gathering of the creditors on 26 March 1801 it turned out that the debts of the deceased amounted to 1,533 fl 27 x. 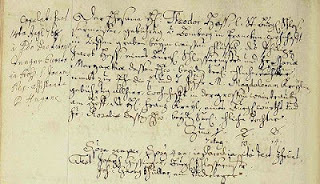 The meager assets were used to cover the remaining rent, the physician's fee, and the burial expenses. Sebastian's younger brother Conrad Heß of course renounced the inheritance. 3) Conrad Heß. He was born in Bamberg in 1737 and also became a locksmith. His first marriage on 10 May 1767 to Eleonora Gissinger (b. 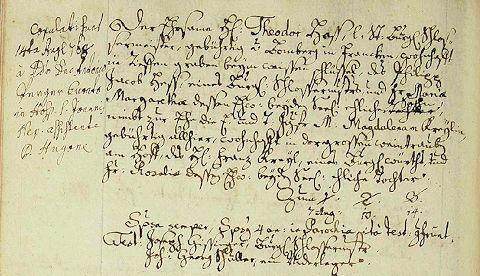 1744, daughter of the Viennese locksmith Joseph Gissinger) at St. Stephen's is the second earliest documentary evidence of a Heß sibling's actual presence in Vienna. After the death of his first wife on 23 December 1770, Conrad Heß on 27 January 1771 married a certain Anna Maria Hallmann, a farmer's daughter from Untergrub in Lower Austria. It seems likely that his brothers and his half-sister Johanna Heß came to Vienna around the year 1770. 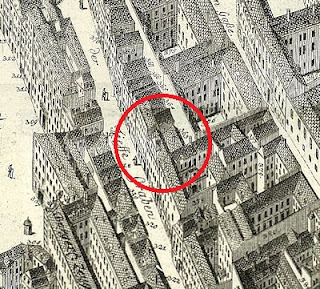 Conrad Heß's success in his profession on 12 May 1786 enabled him to purchase the house Stadt 640 (today Rotgasse 9) which on 2 October 1807 he sold again for 10,500 fl to the merchant Bernhard von Grandin. Conrad Heß and his second wife (who died in 1808) had no children. He died on 31 January 1809 in the house Stadt 756 (today Fleischmarkt 11) and bequeathed 12,733 gulden to his half-sister Johanna and the two children of his younger brother Paul. The main part of his estate however consisted of a debt certificate from the buyer of his house which two years later was to lose significantly in value. 4) Paul Heß. He was born in Bamberg in 1744 and, like his brothers, seems at first to have taken up the profession of a locksmith. His marriage to Katharina Dobler, the daughter of an employee of Archduchess Maria Elisabeth of Austria (1680-1741), took place in Brussels. He had several children of whom only two reached adulthood. It is herewith certified by the Pension Society of Visual Artists in Vienna that Paul Heß is a well-known artist in carving small figures, especially of ivory and that he belongs to the class of visual artists. Owing to the unfortunate revolutions and the lengthy war the livelihood of the undersigned, which made good progress based on the shipment of small ivory works to foreign countries, has been cut back to such an extent that he is unable to raise the necessary deposit for the membership in the aforesaid institution. Heß, Paul Graveur von N° 14 in der Josephstadt, welcher in der Donau ertrunken gefunden und im Allgemeinen Krankenhaus gerichtl[ich] besch[au]t worden, alt 54 J[ah]r.
Heß was survived by his wife, his son Franz Joseph, and his daughter Katharina (b. 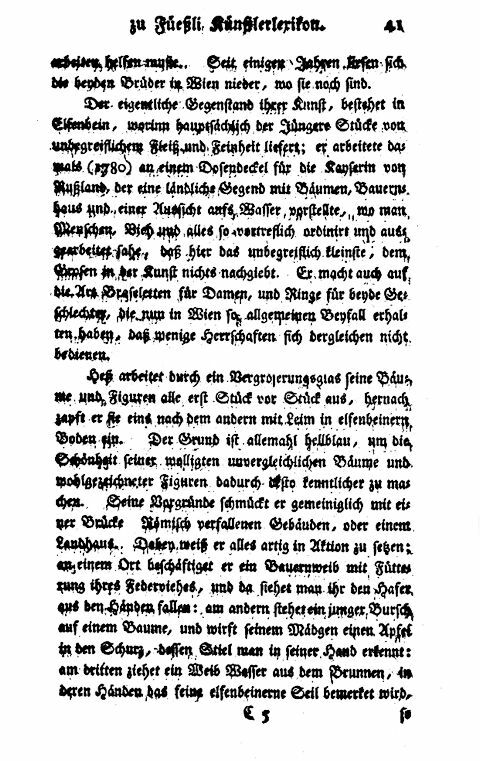 25 October 1778). He left absolutely nothing and his estate was "armuthshalber abgetan" (discounted owing to poverty) by the civil court. 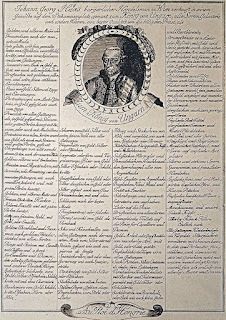 The Emperor, who was notoriously interested in cases of murder and suicide, took keen interest in Heß's tragic death and the protocol of the Imperial Cabinet-Chancellery (A-Whh, Protokoll der Kabinettskanzlei, Bd. 139, Nr. 955) duly notes: "Hess, Paul Elfenbeingraveur. Hat sich wahrscheinlich wegen Schulden in der Donau ersäuft." ("Hess, Paul ivory engraver. Drowned himself in the Danube presumably because of debts"). Not surprisingly none of Paul Heß's three brothers reported to the authorities in the course of the legal proceedings at the civil court. It seems that the rift between Paul and Sebastian was mainly caused by Paul's inability to pay back money his brother had lent him. 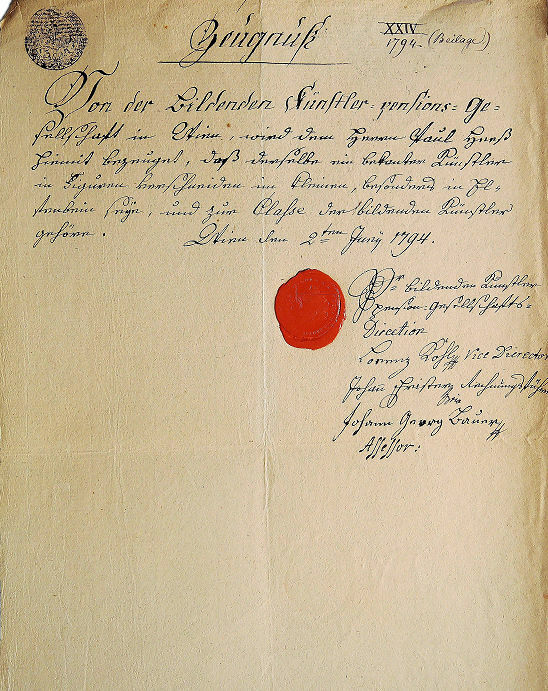 In 1799 Paul's son Franz Joseph Heß was promoted to the rank of Raitoffizier (accounting official), he married and together with his wife and his sister moved to his new place of employment in West Galicia. Paul Heß was not easily forgotten. 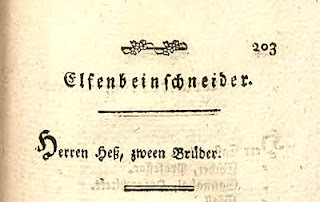 In 1799, his friend, the Austrian poet Johann Carl Unger published a collection of dedication poems titled Feierstunden. 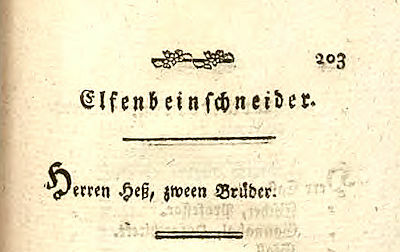 Wiens Bewohnern gewidmet (bey I. Alberti's Wittwe) that contains an "Elegie auf den Tod des biedern Künstlers Paul Heß" ("Elegy to the death of the honest artist Paul Heß"). 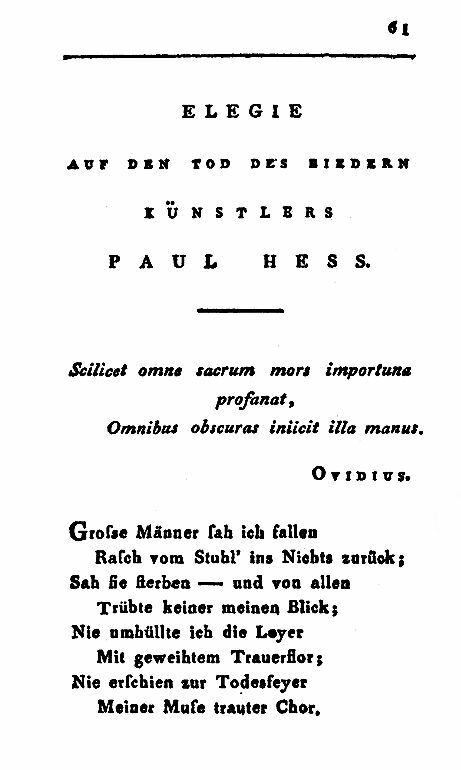 In Unger's poem (of which the remaining five stanzas can be read here) we also learn that Paul Heß was a proficient singer. I do not know where Constanze Mozart's pearl necklace is today. Regardless of its current location – whether it is lost or held by the Mozarteum – its value increases immensely by the identification of the creator of its clasp. Only about 100 ivory micro-carvings are known today worldwide. Most of the Heß brothers' masterpieces are held by the Kunsthistorisches Museum, the British Museum and the Hermitage Museum in Saint Petersburg. The inexplicable mastership of the art of Sebastian and Paul Heß will never cease to amaze.